Do you crochet or knit every day? If so, you’re probably doing a number on your body and you don’t even realize it. I didn’t realize that my passion was causing me pain until I could literally feel it – pain in my shoulders. A few episodes back I shared that story as well as some ways to avoid aches and pains while we crochet. That episode led me to today’s guest, an expert in the physical fitness and wellness world. I’m so excited to share today’s guest, Elena with you. She is so passionate about health and wellness and you can feel it as she speaks. We started off with the idea that we’ll arm knitters and crocheters with the knowledge they need to be healthy so they can continue their passion but as we got into it, realized that it really requires wellness all around. Elena cares so much about your health and well-being and she pours her knowledge to you on today’s show! Now if you haven’t done so already, click on that play button at the top of the page to hear from Elena! 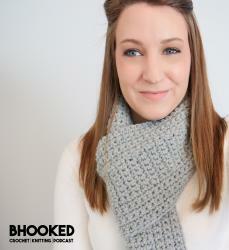 Loop-it yarn is a brand new type of yarn that doesn’t require hooks or needles! You can create gorgeous projects with only your fingers. I’m thinking this is a great after school projects for your kiddos and even a great change of pace to break up the repetitive motions of knitting and crochet. Check out Loop-it Yarn by Red Heart at your local Michael’s store. You can order directly on their website or from Redheart.com! Simple Stretching for Wellness – great for knitters and crocheters! Also, please leave an honest review for the B.hooked Podcast on iTunes. Ratings and reviews are extremely helpful and greatly appreciated! They do matter in the rankings of the show, and I read each and every one of them. And finally, don’t forget to subscribe to the show on iTunes or Stitcher to listen to each episode right on your mobile device.